Alexandra Swann, dubbed the ‘future face’ of UKIP has hit back after a string of media outlets suggested she had walked out of UKIP over its stance on immigration. Miss Swann, who has spoken exclusively on the issue to Breitbart London, says she is “surprised” that an Independent journalist “has gone out of her way to misrepresent” what she had said. 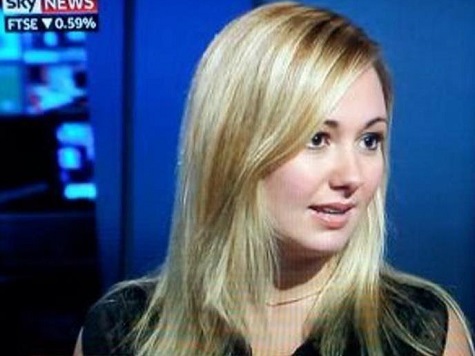 Miss Swann is a former House of Commons staffer and Deputy Chairman of Conservative Future. In 2012 she decided to defect to UKIP and was hailed by Nigel Farage saying “the Swann has migrated”. However, more recently, Swann has had a change of career and had decided that political campaigns were incompatible with her new role. A number of newspapers have claimed that she is now refusing to campaign due to falling out with the party over immigration. Swann told Breitbart London: “I am rather surprised that a fellow young woman has gone out of her way to misrepresent what I said, out of context, on London Live yesterday. “While I do think UKIP should focus on its positive policies – such as a flat rate of income tax, grammar schools, and removing the neo-Malthusian green taxes imposed by Brussels that push the vulnerable into fuel poverty and jobs and investment offshore – I agree with UKIP that while we remain in the EU we should have a points-based immigration system. Tom Bursnall from the UKIP National Executive, also on the ultra-free market wing of the party, was amused on how the misinterpreted views one party member grabbed the national media’s interest. Speaking exclusively to Breitbart London he said: “Tens of thousands of Tory party members do not agree with their party’s policy agenda on a host of issues from immigration, green taxes, and Europe – but do we get articles that Tory party member Mr Smith from Woking South is not 100% aligned with Tory party policy? Of course not… The vulgar left wing media try their best to halt the UKIP machine anyway they can – its amusing more than anything. “Indeed Swann seeks a ‘points based system’ based on quality and skills which is party policy, but that given the influx over the past 10 years – quantity (not just quality) is an issue that needs dealing with first due to the British benefits system.